Windows 10 Enterprise offers quite a few exclusive features that aren’t available in the Professional edition of Windows. You can get these features without reinstalling Windows, and without even having an Enterprise disc. In fact, you don’t even need your own Windows 10 Enterprise key to perform this upgrade. According to Microsoft’s documentation, it’s possible to use the DISM /online /Set-Edition: command to change to a new edition of Windows. However, this didn’t work for us with Windows 10 and we encountered error messages. But we realized there’s a better solution. Most people don’t know this, but you can convert your existing Windows 10 Home or Professional system to Windows 10 Enterprise in just a few minutes–no disc necessary. You won’t lose any of your installed programs or files. To do this, you’ll need a product key, but there’s a bit of a loophole here: You don’t actually need a legitimate product key to use Windows 10, Enterprise or otherwise. To upgrade, you just need a key. This process uses a KMS key from Microsoft’s website. These publicly-available keys are normally used in organizations with Key Management Servers. Use them without a Key Management Server and Windows 10 will upgrade to Enterprise–it just won’t be truly “activated”. And there’s the one downside to doing this: If you have a legitimate, activated Windows 10 system, the resulting Windows 10 installation won’t be activated and will show you a watermark telling you so. But that’s just about the only limitation you’ll encounter–the OS will otherwise work just fine, for as long as you like. If you have a Windows 10 virtual machine or secondary computer you want to test these Enterprise features on, this is an excellent solution. This works even better if you do have a legitimate Windows 10 Enterprise product key through a business. Enter a legitimate product key and Windows 10 will upgrade to the Enterprise edition and become properly activated. This is a convenient solution for businesses, which can purchase computers that come with Home or Professional editions of Windows 10 and upgrade them without a reinstall. Rather than messing with DISM, you can do this entirely from Windows 10’s Settings app. To do so, open the Settings app from your Start menu, select “Update & Security,” and select “Activation.” Click the “Change Product Key” button here. You’ll be asked to enter a new product key. 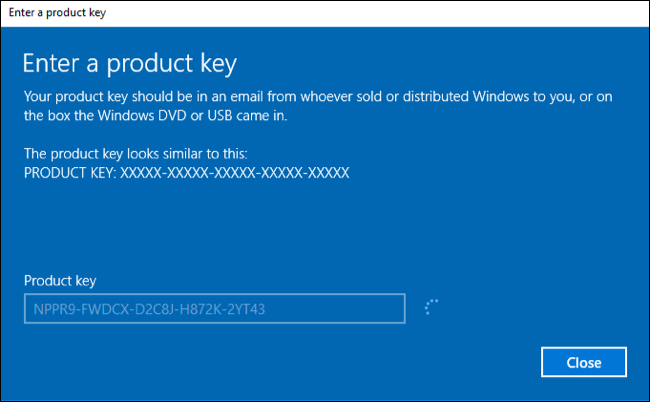 If you have a legitimate Windows 10 Enterprise product key, you can enter it now. But if you don’t, grab the KMS client setup key for Windows 10 Enterprise and Windows 10 will automatically convert itself to a Windows 10 Enterprise system. 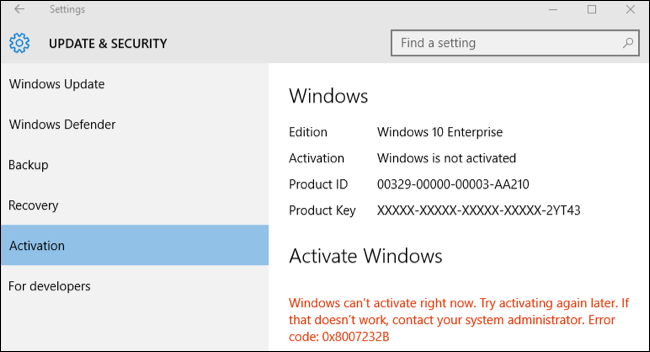 Remember, as this isn’t an valid key for activation, the resulting Windows 10 system won’t activate with Microsoft’s activation servers online. You may not want to do this on your primary Windows system. The above Microsoft web page lists keys for other editions of Windows 10, so you could instead convert to Windows 10 Professional, Windows 10 Education, Windows 10 Enterprise 2015 LTSB (Long Term Servicing Branch), and other editions of Windows 10. 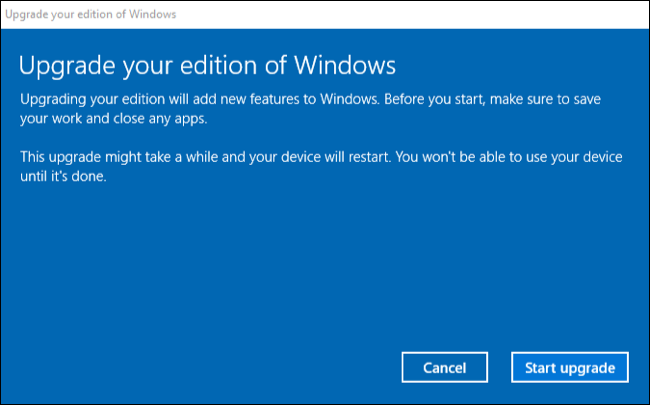 After a moment, Windows 10 will offer to “Upgrade your edition of Windows.” Be sure to save your open files and close applications before continuing, as your computer will restart during this process. Windows 10 will reboot when the process is done. This process took us less than 20 minutes, even in a slower virtual machine. After the process is complete, you can visit the Settings > Update & Security > Activation again. You’ll see that you’re now using Windows 10 Enterprise. All the Enterprise-only features will be available on your PC. However, if you used a KMS key, your system will no longer be activated and Windows 10 will begin to inform you of this. That’s a fine trade-off for being able to try out these features in a virtual machine or on a secondary PC, but may not be convenient on your primary PC. Does Microsoft have a problem with this this? We don’t really know, but if they did, they could fix the problem in several ways, so it’s likely this is by design. It’s a convenient tip for developers, enthusiasts, and system administrators who want see what those extra features are all about.